Inbox2DB automatically collects data from inbound messages, so that it's no longer required to copy/paste data from email messages to an excel sheet by hand. 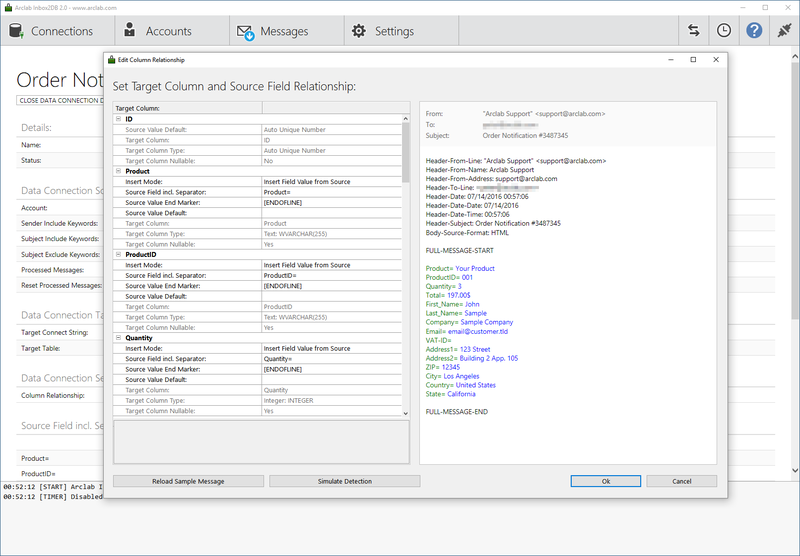 Each source data field in the email can be assigned to a cell in your excel sheet and you can setup multiple data connections for different source email formats. The detection routines are customizable and can be adjusted according to the format of the inbound message. The setup is easy and straight-forward. You can assign source fields and values based on a sample message, which allows you to setup a data connection within minutes. The program runs on your computer, can handle multiple data connections and works with your regular email account. There is no special hosting etc. required. Please add the column names to the first line of your MS Excel sheet and a sample row to the next line. The sample row makes sure, that the program can determine the correct data type during the setup of the data connection. You don't need to care about cast operators, etc. ... the program automatically detects the corresponding data type for each column based on the sample row.